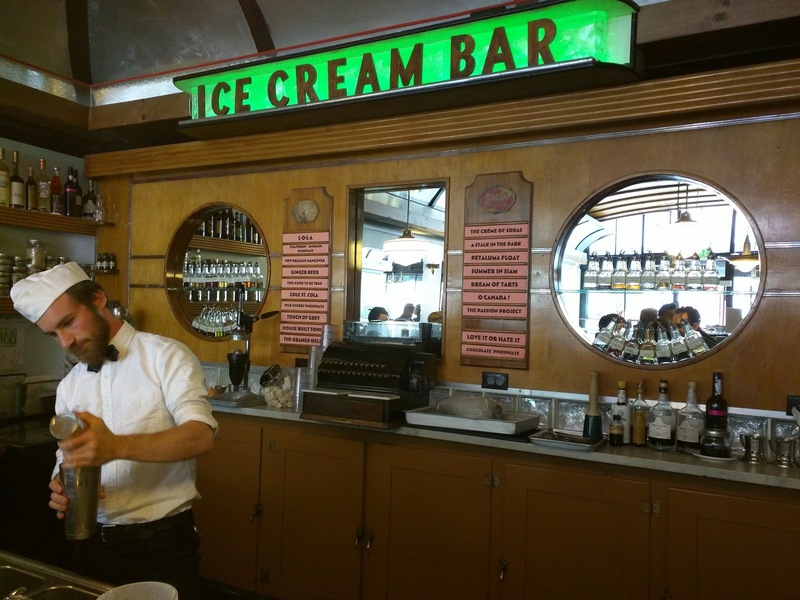 The Ice Cream Bar is an old fashioned soda fountain located in Cole Valley. Sounds right up my alley, right? I was really excited about it, at least in concept, when it opened, but somehow didn't manage to get there until recently. I have read plenty of reviews though, and, in the end, I agreed with them entirely. One word summary? Overrated. Second word? Expensive. Honestly, just not worth it. It is cute, for sure. Except, I found it a bit ridiculous, rather than charming. There was something about it that just seemed like they were trying too hard. 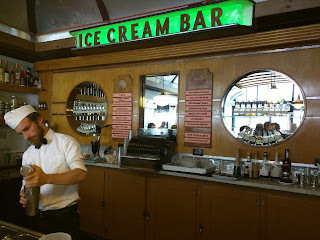 I know they are passionate about being an authentic 1930s soda fountain. They use high quality organic dairy. They make everything in house. But ... it is just too expensive, and not actually much better tasting than the alternatives. When you enter, the first counter is for ice cream. A number of flavors are available, plus toppings. I heard great things about the Banana Puddin flavor, so, even though it was freezing out and I didn't want ice cream, I couldn't resist at least trying it. It was ... ice cream. Decent banana flavor, bits of something like nilla wafer in it. But really, just ice cream, and not worth the prices they charge, at least in my mind. They also have a number of decadent looking sundaes. 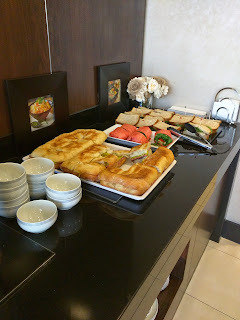 From this area you can also order savory food, as the menu includes a few sandwiches and burgers. I didn't ever see anyone get one, and it clearly isn't the focus of the establishment. The back of the restaurant features the soda fountain, with a soda jerk wearing a silly hat and bow tie and all. It is here that all the soda based drinks are crafted. 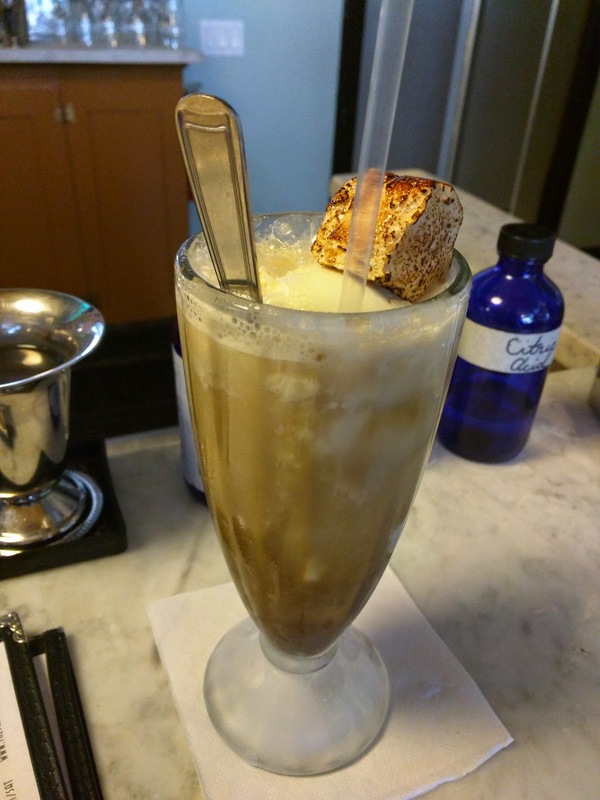 This includes not just basic sodas, but also boozy creations, malts, milkshakes, and floats. They also offer beer and wine for the less adventurous. The malts and milkshakes are classic style, using milk, egg, and ice, not ice cream. If you want ice cream, you need to go for a float. The sodas make up the largest portion of the menu, ranging from a $5 ginger beer to a $9 "Touch of Grey", featuring candy cap mushroom syrup. Speaking of syrups, all the housemade tinctures were lined up on the bar in front. A bit show-offy. 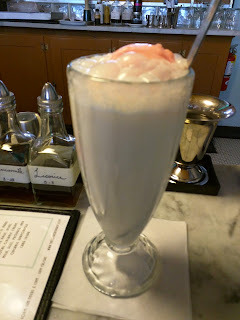 "A float of fruit sorbet in a tart Straus yogurt soda, with a double-dose of lactart." Ojan selected literally the only drink I had zero interest in. Sorbet is useless to me, and yogurt drinks I rarely care for. I still tried it of course. It was exactly what I expected. The yogurt was tart and yogurty. The sorbet was fruity and icy. The foam was nice. Ojan didn't like it either, nor did anyone else in our group. After a few sips each, it went entirely unfinished, a complete waste of money. At $8.50, it was also one of the priciest options, and it really wasn't worth it at all. The Creme of Sodas. $7. 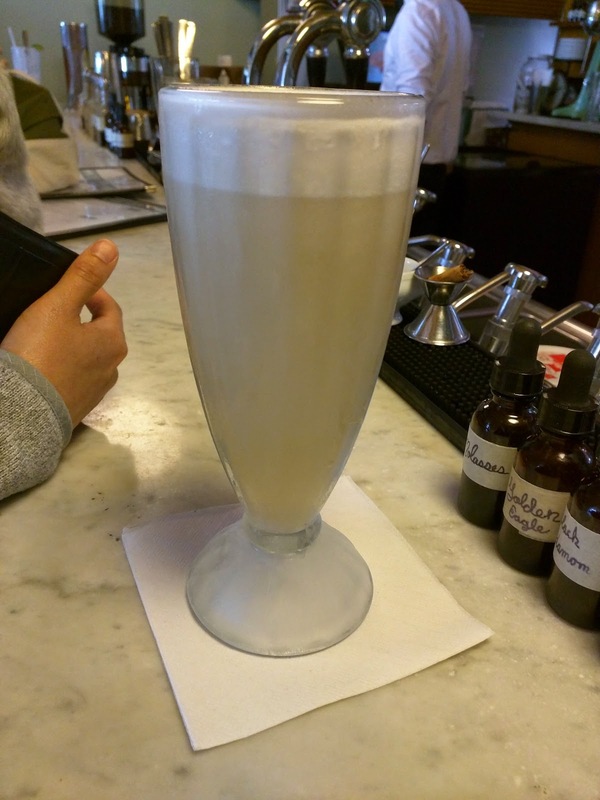 "Sarsaparilla tincture, vanilla extract, turbinado syrup, egg white, lactart, soda." I adore cream soda, so this was actually the one I was most interested in, of the sodas. It was decent. Nice flavor, probably more complex than any cream soda I've ever had before. The froth was impressive. But $7 soda? This just isn't my style. Russell's Sasafras Root Beer Float. $8. 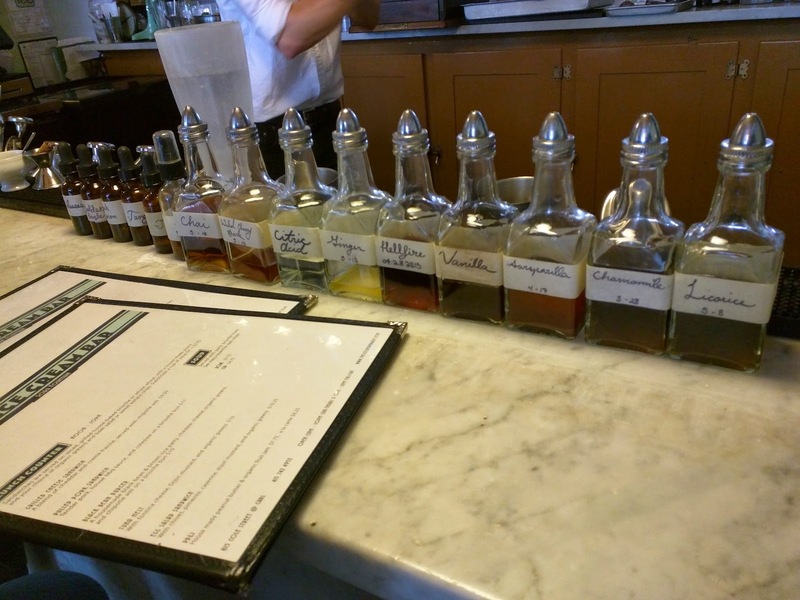 "Our cold-brewed sassafras based elixir made with 11 herbs and spices." The final member of our group opted for the root beer float, something he's had a number of times and loves. It is their housemade root beer, plus a scoop of their housemade vanilla ice cream, topped with a marshmallow torched to order. It was a good root beer float, but, at the end of the day, just a root beer float. I honestly didn't think it was much better than a can of classic A&W with a scoop of generic vanilla ice cream in it. When you mix things together like this, the subtlety of the high end ingredients is lost. The price is $6.50 for a root beer, or $8 for the float, which, given their pricing, was actually a bit reasonable, since it had so much going on. Ah, Alexander's. 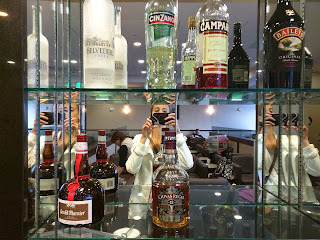 By now, you know that Alexander's is my favorite restaurant in SF. But I didn't visit for a while. Not because I stopped liking Alexander's, but because I just haven't been going out to eat in San Francisco. Anyway, I'll skip the basics about Alexander's, because you can read all about those in my slew of previous reviews, and focus just on this experience. I'll be honest, the meal didn't start out amazing for me. The initial dishes weren't ones I loved, due to my own preferences, but, in true Alexander's fashion, it did turn into a great meal. As always, the highlights for me were the appetizers and the extra gifts from the chef, although dessert was also a strong point, always a plus for me! There were a few slight service hiccups, like the sommelier visiting our table right when the food was presented, so I wasn't able to catch descriptions of some of the first courses. The bread server didn't tell us what the different breads were. But overall, the service was fantastic as always, and the staff friendly as ever. I don't think I really need to say that I'll obviously return. Bread #1: Manchego and Onion Gougère. The first "bread" service to begin the meal used to be a cracker, sometimes interestingly spiced with something like za'atar or furikake, sometimes cheesy like the addicting Point Reyes blue cheese and walnut crackers. I always liked the crackers, a welcome change from traditional bread and quite nice to nibble and crunch on. 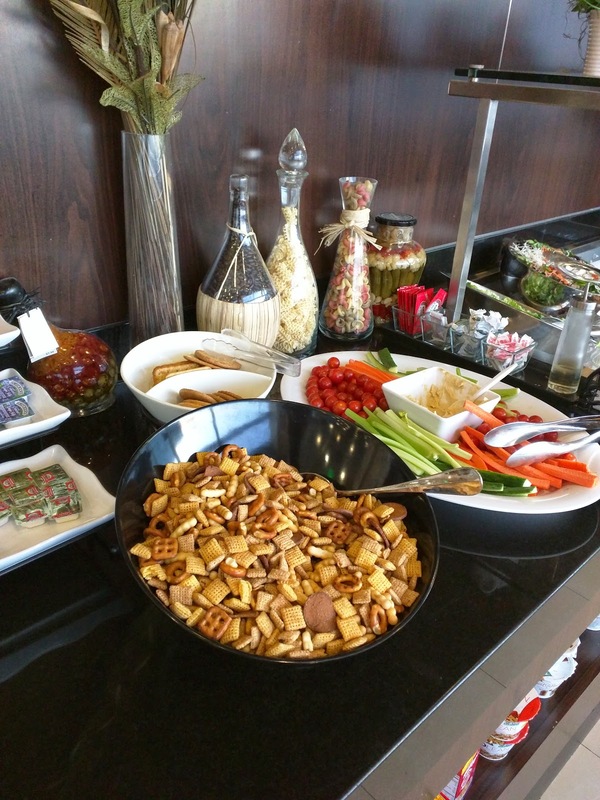 Then again, I'm a sucker for snacky foods. This time, the first bread service was a gougère (an interesting choice for a Japanese inspired steakhouse), served to us individually on our bread plates from a central basket. The cheese was manchego, and it was studded it with both green and red onion. It was delivered quasi-warm, not really with that "fresh from the oven" feel, but also not room temperature. It was cheesy, herby, salty, and had a lot of flavors going on, but I don't really like manchego, so I didn't care for it. The others all loved it, and gladly volunteered to take mine off my hands. Ojan in particular loved this, but it was my least favorite of the bread line-up. Simultaneously with the bread came our amuse bouche. 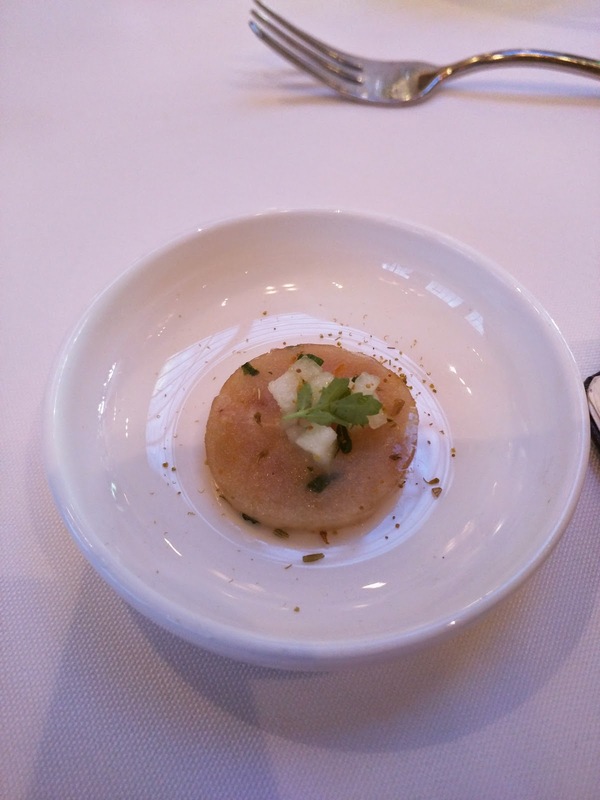 The amuse bouche is always one of my favorite moments at Alexander's. 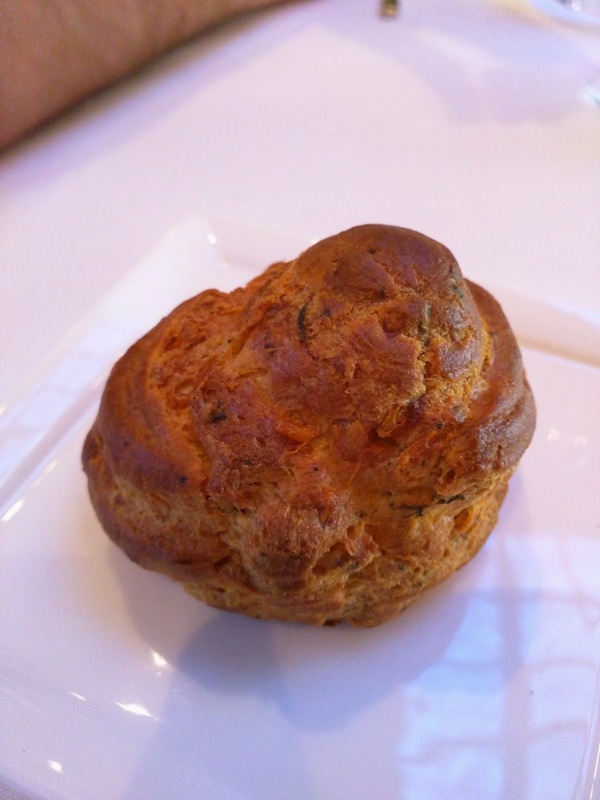 They manage to put together some crazy flavorful little bites, like the toasted brioche with eucalyptus truffle cream from years ago, that I still remember to this day. This meal began with hamachi tartar topped with fennel apple salad. The hamachi was nicely chopped, the fennel gave a strong flavorful burst, and the apple was light and refreshing. Very balanced, and a nice opener to a meal. Of course, I don't really like hamachi, so another dish that I didn't love, just due to my own preferences. I wish I liked hamachi and manchego! Hamachi Shots: avocado / serrano / cilantro / yuzu-soy / garlic / radish ($5 each). Now, we get to a few items we ordered. 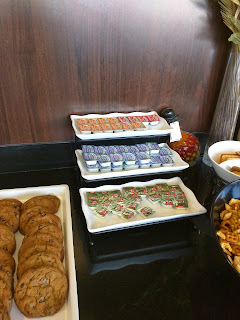 The first section of the Alexander's menu contains "snacks", items either served as individual bites like these, or easy little share plates such as fried shishito peppers or edamame, designed to be quick little snacks to have alongside your cocktail or bubbly as you browse the rest of the menu. These items always arrive lightening fast, and these were no exception. 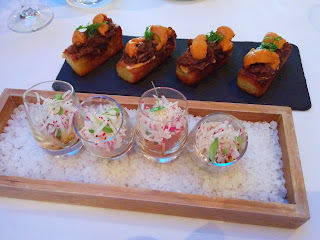 We started with two selections: Uni Toasts and Hamachi Shots. In my past life, I always skipped the snack section of the menu, that is, until I discovered the uni toast. I obviously love uni, and so I tend to order any uni dish I come across, even though, I'll be honest, the first time I read the description of the uni toasts, I wasn't necessarily sold. Oxtail? But on my last visit, it was the dish of the night for me (although I did prefer the shortrib ragout version a few months earlier). I fondly recalled the warm toasted brioche, the creamy thousand island sauce, the flavorful oxtail, and of course, the uni on top. It reminded me of a (very fancy) reuben on that first encounter. This time it was a slight letdown, but only because my expectations were so high. The brioche base was a bit too rich and oily. I still enjoyed the creamy thousand island, and thought the oxtail was perfectly braised, incredibly tender, but it was also quite rich. Of course, I loved the uni on top. Maybe I just wasn't in the mood for this tonight, or maybe I wasn't quite ready to move into such a heavy bite to start, as I obviously adore rich food. It somehow was my second to least favorite dish of the night. Several folks at the table also enjoyed the signature hamachi shots, with avocado, serrano, cilantro, yuzu-soy, garlic, and radish. Since I don't really like raw hamachi, and I'm allergic to avocado, I skipped this course, but I've reviewed it before (sans avocado, of course). The hamachi shots are an Alexander's signature dish, and the others all thought they were fine, but weren't wowed. Best summed up by one diner as "a very approachable dish". Anyone who eats raw fish would find these very easy to deal with, and be amused by the shot glass serving, but for the more adventurous, there are far more interesting options on the Alexander's menu, which we'll get to soon. 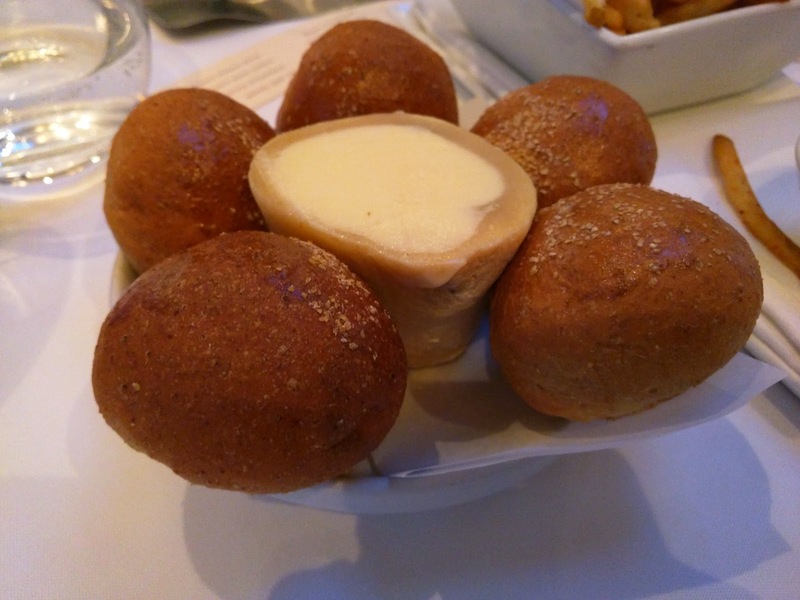 Bread Service #2: Parker House Rolls, Strauss Butter, Fleur de Sel. The second bread offering remained the same as it has for a while now, although on our last visit, it showed up after our steaks. This time, the Parker House rolls properly appeared alongside our next set of dishes, the first courses. They were served warm, and I loved the fleur de sel on top. Others were very impressed with the perfectly soft butter log on the side. 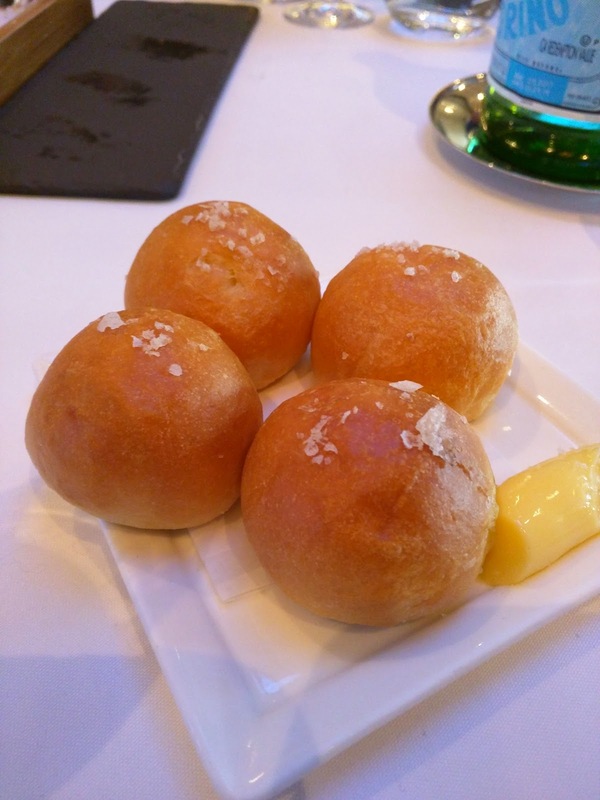 These were fine, soft little rolls, but I've had "real" Parker House Rolls from the Parker House in Boston, and, even though their catering service is lackluster, the rolls were the highlight of my meal there, and I preferred those. First Course: Smoked Foie Gras: koshihikari rice / toasted nori / braised seaweed / charred scallion $38. From the first courses, we had a hard time narrowing down to only a few selections. 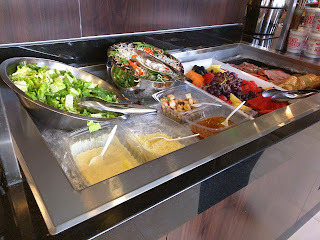 The grilled Firefly squid with asparagus really caught my eye, but no one else was interested. And of course, now that foie gras is legal again in California, I obviously wanted some foie. We had two choices, chilled or smoked. Since the chilled one contained truffle, which Ojan doesn't love, we went for the smoked. I've only had smoked foie gras one other time, at the final foie gras dinner hosted at Alexander's before the ban, but that was a totally different preparation (although, totally amazing). 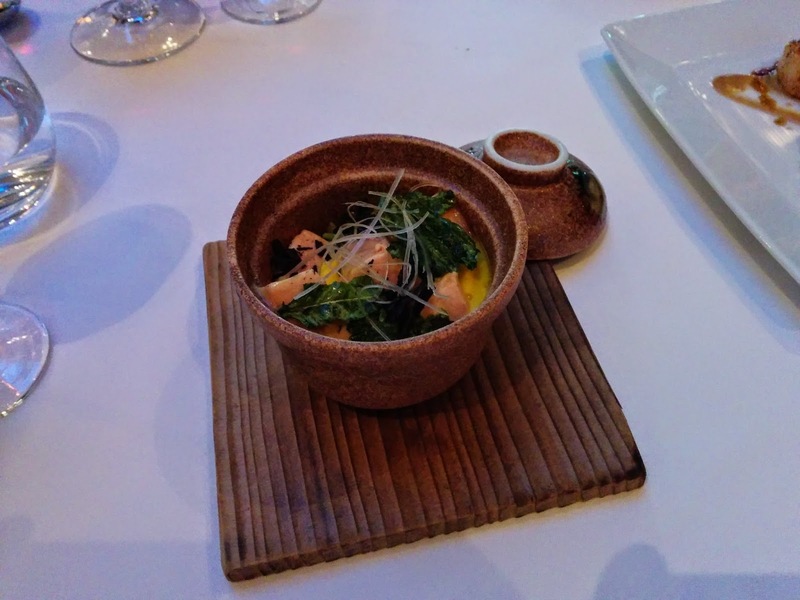 It came served in the same earthen vessel as the uni chawanmushi I had once at Alexander's. This dish was served warm. In the bottom of the bowl was koshihikari rice, topped with egg, scallion, and broccoli raab. It was creamy and rich, total comfort food. Maybe because it was served in the same bowl that I remembered the chawanmushi from, it somewhat reminded me of chawanmushi, in that comforting way. On top was the smoked foie, in five distinct chunks. There were five of us, so this was perfect (did they do that on purpose?) The foie was mild, it didn't have a really strong liver flavor. I could have used a little more foie taste, but it was soooo creamy and I loved it just the same. Topped with toasted nori for bit of crunch. This was a real crowd pleaser, and we all agreed that it was pretty much perfect comfort food. Some go for mashed potatoes or mac and cheese, well, we go for smoked foie gras :) My second favorite dish of the night. Others also enjoyed the scallops as a first course, which I ordered as my main, so I didn't partake of in this round, and I'll leave the review until later. Gift from the Chef: Joe Uni. During the lull between first courses and mains, a magical gift arrived from the kitchen. I believe they called it "Joe Uni". Given my love for uni, you can imagine how pleased I was. I know this doesn't look like much. And when I describe the components, it won't make sense. But I assure you, this was phenomenal. On the bottom, espuma. On top of that, pie crust crumble. On top of that, uni and strawberry. Garnished with arare masago and jalapeño. Yes, I know this sounds crazy. And it was. Crazy delicious, that is! Let's break it down. The espuma was creamy and delicious, made from mangalitsa. Once he finished his plate, Ojan said "would it be inappropriate to pick this up and lick it? ", which, of course, he did. At one point, Ojan also said it tasted like "Big Mac Sauce", which uh, somewhat dumbed down the experience (and, once he said that, I totally tasted it too). The pie crust I believe they said was "mango dough", perhaps referring to the mangalitsa too? It was quite rich, and, as a dessert girl, I loved to see pie crust appearing so early in my meal. It was more like a crumbly, soft biscuit than a pie crust really. The strawberry was actually pickled, so it was quite tart, while still providing some sweetness. So at this point, we basically had strawberry shortcake. Doughy base, strawberries, and creamy component. And then ... add on some uni. Oh, did I mention the uni was drizzled with a blue fin tuna sauce? I know this still doesn't sound delicious? Who cares, it was. Hands down, best dish of the night, and one of the best bites I've ever had from Alexander's. While the earlier gifts didn't match my tastes (manchego, hamachi), this one just nailed it. Even if you weren't catering to an uni-loving girl who grew up eating tons of strawberry shortcake, I think this was a stunner. The whole table agreed. Yes, strawberry shortcake with uni and big mac sauce ... a winner. Full of textures, so many complex flavors, and yet somehow, it all worked. 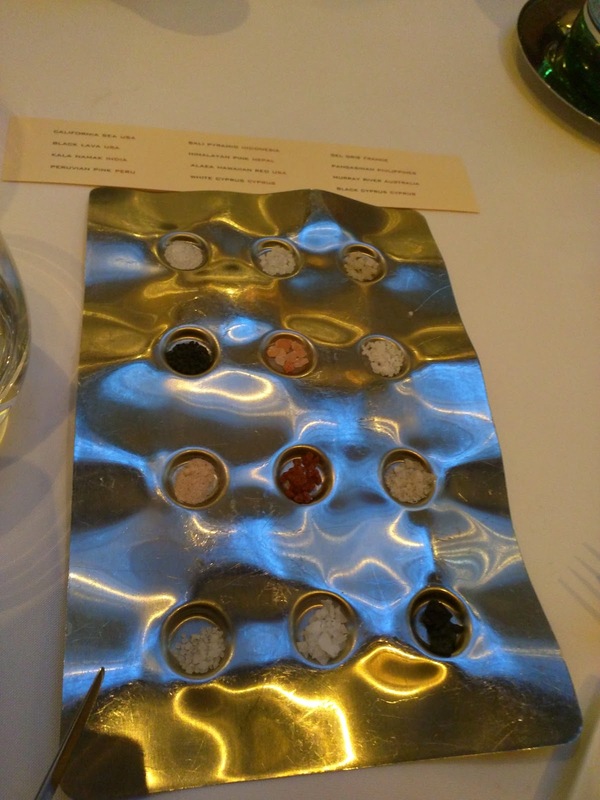 Since several folks at the table ordered Wagyu steaks, the impressive trays of salts were then brought out, with 12 unique salts. They brought us two of these, even though one would have sufficed to cover those who actually ordered Wagyu. They even offered to bring a third if we required it. The staff wanted everyone to get a chance to taste the salts, even if they didn't select the premium steaks, a really kind touch. As always, our guests found the salts fascinating, and the salt sommelier talked through many of the selections with our group. Of course, he left a card behind as a cheat sheet to keep them all straight. I always love the salts, and this was no exception. We all occupied ourselves until the next round of food arrived tasting the salts, and picking our favorites. They even provided little tiny salt spoons this time, which was nice, I always felt a bit silly licking my finger and sticking it in the salts (I mean, I didn't do that ...). Side: Grilled Asparagus: dry-aged beef hollandaise / lemon / bonito. $15. All entrees at Alexander's are served a la carte, so sides are served family style for the table. Now, I generally find the sides at Alexander's lackluster, at least compared to all the amazing starters. 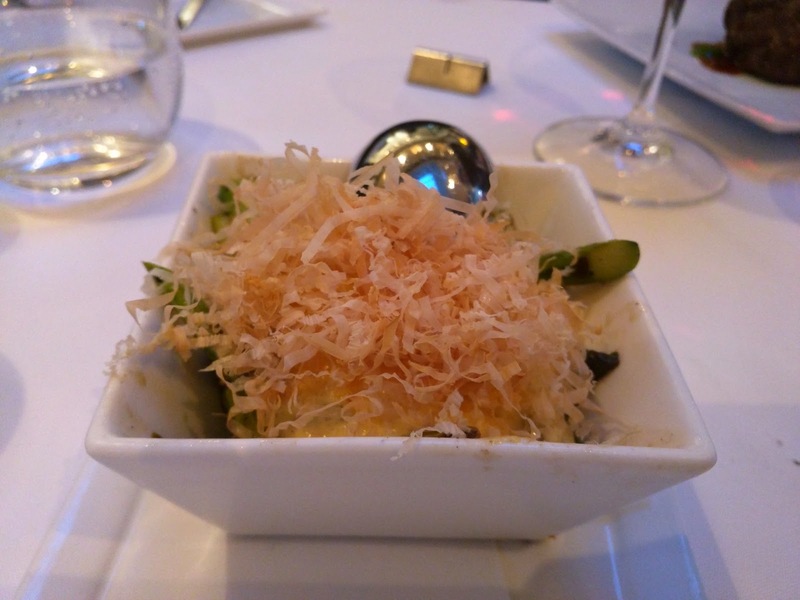 That said, I've had a few standouts over the years, and one was an asparagus gratin. So when someone suggested the asparagus this time around, I was up for it. Also, I had grilled jumbo asparagus a few days prior that I was in love with. Ah, spring! The asparagus was thin style, nicely grilled. The beef hollandaise was creamy and of course I loved it. I'm such a sucker for anything mayo/aioli/hollandaise-like. Bring on the eggs and fats. On top was a ton of bonito. This dish was fine, but, again, compared to the starters, it just wasn't something I'd go back for. Least favorite dish of the night. 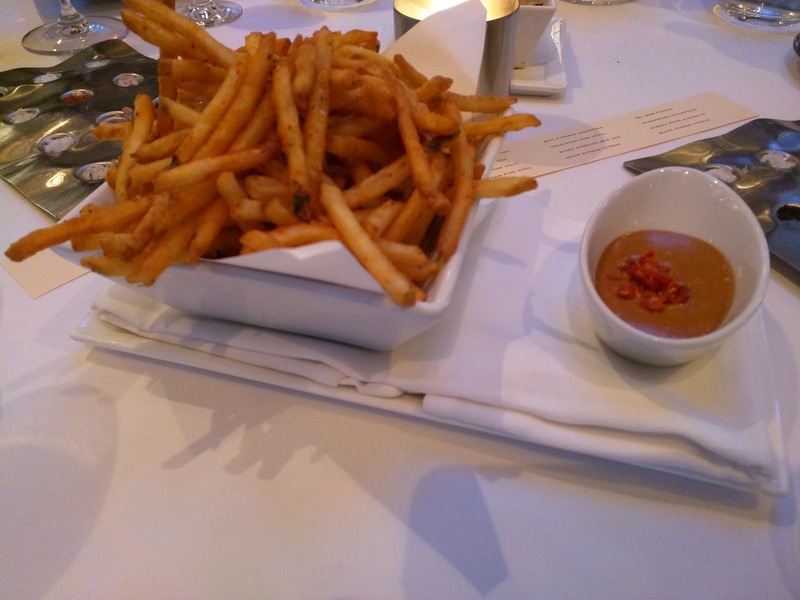 Side: Shichimi Fries: sundried tomato - tonkatsu aïoli / shichimi. $14. We also ordered the fries. Yes, the fries. I remember the first times I had the shichimi fries, when I was splitting a burger with Ojan, and it came with fries. We wouldn't have ever ordered them otherwise, who wastes stomach space with fries? Except, I was stuffed that day, and still got totally addicted to them. The same thing happened when we visited with Emil's family, and his sisters ordered the fries. I'm the one who polished them off. So addicting. So when our Australian guests suggested the fries, I laughed slightly because they ALWAYS want fries, er, chips, but I didn't say no! The fries were exactly as I remembered from all my previous visits. Thin and incredibly crispy, nicely spiced from the shichimi. Totally addicting. And being a creamy sauce lover, I couldn't stop dipping them in the creamy tonkatu aïoli. $14 for a side of fries might be high, and I usually prefer thick wedges over thin fries, but, these somehow always manage to impress me. If you like thin fries, get these, for sure. Tajima F1 Aus Filet, 3 oz. $48. Ojan and one other diner both ordered the Tajima F1 filet, medium-rare. I was really not in the mood for steak, so I didn't even demand a bite. Ojan did say it was the least memorable of the fancy steaks he has had at Alexander's though. Two others went for the regular filet mignon, served with bordelaise. One added seared foie gras on top (extra $30). As I've reviewed many times, Alexander's always executes the sear on the foie flawlessly. I've had a lot of seared foie gras over the past few years, but no where has ever managed to do it as perfectly as Alexander's. This was no exception. The sear was perfect, the foie was perfect, and of course I know this, because the diner who ordered it decided to be generous and share with me immediately upon receiving his dish. Later, as he approached food coma, he ceded the remainder to me as well. Sadly, I have no photo, but let me assure you, it was foie gras perfection, a very sizable chunk of foie gras perfection at that. 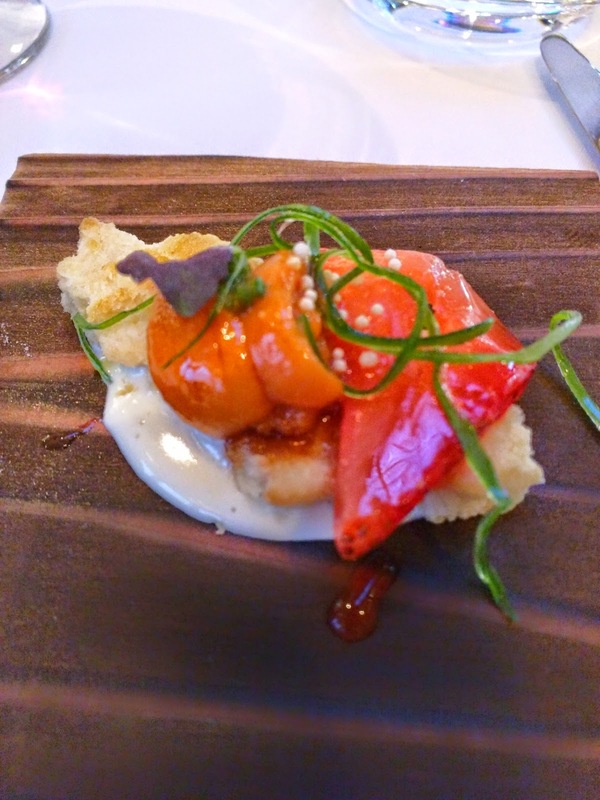 First Course: Seared Scallop: pig tail roulade / chicharron butter / crispy polenta / radish / mustard seed. $27. And finally, my main attraction. As I said, I really wasn't in the mood for steak, and I knew we'd be ordering a slew of share dishes so I didn't want the single main dish seafood option on the menu, a whole roasted fish. It sounded delicious, but I knew that would be way too much food. So, I ordered the scallops for my main, even though they are technically a first course. Just like uni and foie, scallops are some of my favorite items. Yes, this meal was filled with all of my favorites! Remember the time Chef Zare combined all these for me into seared scallops, with uni sauce, topped with seared foie gras, asparagus, and prosciutto? OMG. 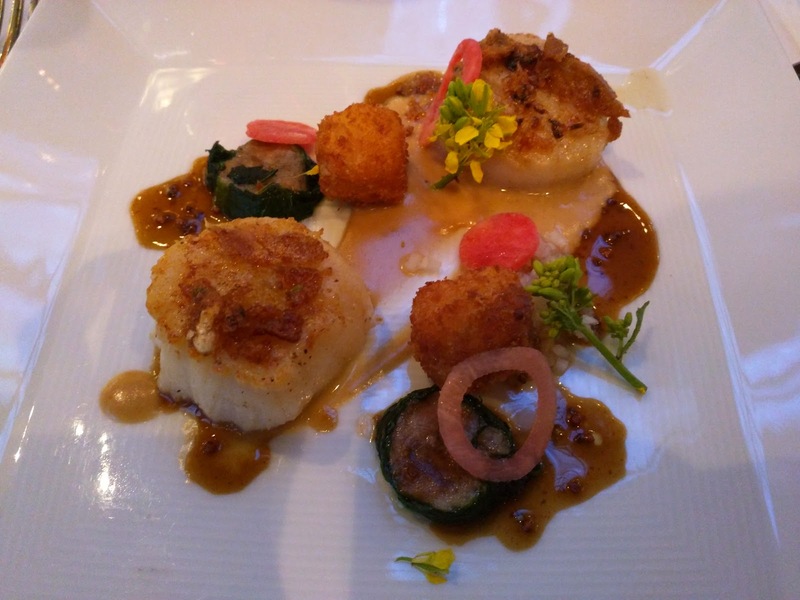 And, just like seared foie, Alexander's does seared scallops better than anywhere else. I went to a cooking demo by Executive Chef Mark Zimmerman, and learned the secret: butter. Oh, so much butter. But back to this dish. It came with two of everything: two scallops, two pig tail roulades, two polenta bites, etc. The scallops were good, tender, mild, slightly sweet, but actually didn't have the a hard sear on them I was expecting. I easily overlooked this though, as they were totally infused with chicharron butter, and the bits of crispy chicharrons on top added an awesome crunch. Pork products showed up in the pig tail roulade as well, wrapped in mustard greens. The crunch also re-appeared in the crispy polenta bites, which resembled tator tots in appearance. I appreciated the crispy nature of these, but I didn't actually like it, as I generally prefer my polenta creamy. Mustard seeds, tiny slices of radish, and mustard seed flowers completed the presentation. Overall, this dish was good, and I really appreciated the salt level to it, presumably from the chicharrons. The chicharrons were certainly the winning element. 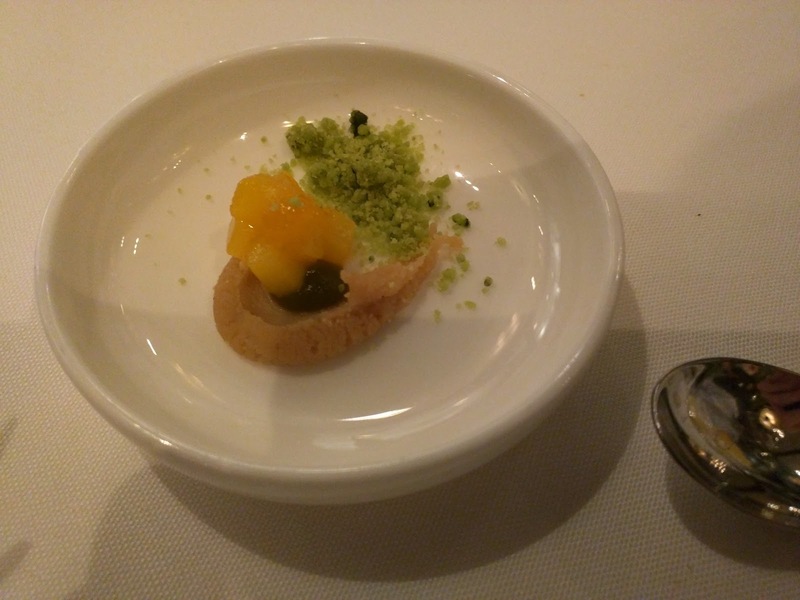 But, compared to the uni and foie dishes, it wasn't as strong as a contender. Bread #3: Rolls / Wagyu Butter. And, the final bread service. It was delivered alongside the mains, and the server didn't tell us what it was. I think some kind of heartier wheat roll? 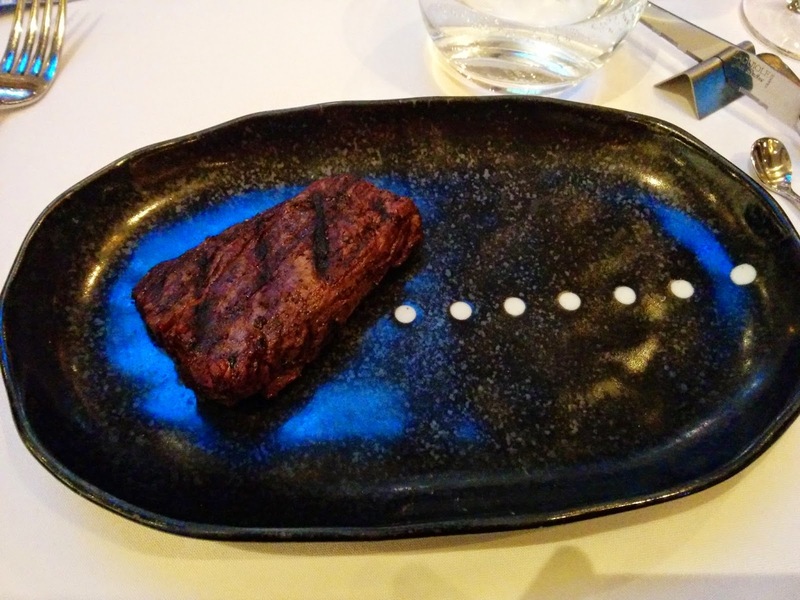 We recognized the butter immediately though, wagyu butter, served inside a marrow bone. I sometimes think Ojan comes to Alexander's only for this butter (I'm only half joking). He loves it. Quote of this round again comes from Ojan, as he slathered his role in butter, and observed the more reserved way others were doing it: "If you can see the bread, you are doing it wrong". Yes, simply use the bread as a way to eat more Wagyu butter. Seriously tasty stuff. Ojan may or may not have left with a container full. Did I mention that Alexander's spoils us? Now, time to move into my favorite part of most meals: dessert. Well, normally dessert is my favorite part of the meal, but I'll be honest, at Alexander's, I actually tend to like the savory food more than the dessert. I know, this is unheard of for me! Along with dessert, I also ordered coffee. I asked for an Americano, and specified that I'd like it served alongside the dessert. I always hate it when I order a coffee intending to pair the bitter goodness with my sweet dessert, and it arrives long before dessert. I know some people want a coffee to ease them into dessert, but for me, it is all about the pairing. This means I either sacrifice my pairing or let it get cold. I've learned to just be clear about what I want, and, Alexander's obliged. It arrived right as the desserts were placed in front of us. Served with creamer, two types of sugar cubes, and a little almond biscotti. 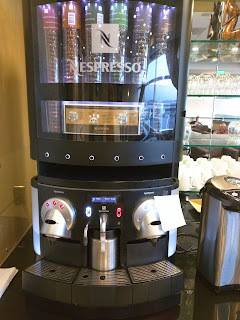 It was fine, not notable, and for a decaf, that means it didn't have any strange decaf "funk" to it, so, not bad. Dessert: “grasshopper” soufflé : mint creme sandwich cookies / mint chocolate chip ice cream. $16. Alexander's always has a soufflé on the menu. I never choose to order it, although most of the time I visit with a group, someone always wants the soufflé, like the last time we went with other Australian visitors and had the grand marnier soufflé, which was notable only because of the amazing crème anglaise, which Ojan took to drinking on its own. If you want awesome soufflé, go to Cafe Jacqueline. 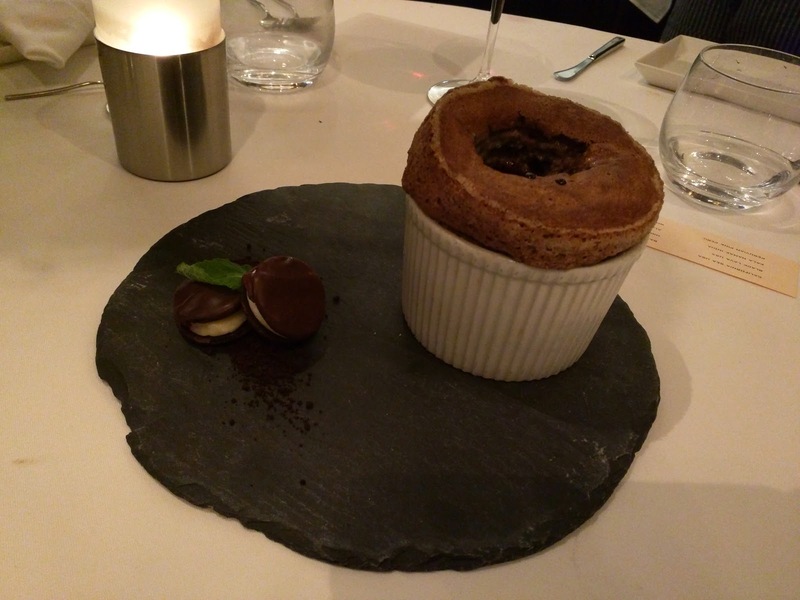 The soufflé arrived untouched, but the server poked a hole in it, and added a generous scoop of mint chocolate chip ice cream tableside. On the side were two mini sandwich cookies filled with mint creme. Since I try not to have chocolate in the evenings, I didn't have much of this, but I did appreciate the minty chocolately flavors, always a nice combination. I think people were either stuffed or didn't love it though, as some of this went untouched. Dessert: Apple: fried apple pie / ricotta / caramel / celery / chicory ice cream. $13. Next up, the dessert I had my eye on, called "apple". The primary component was a fried apple pie. It was warm, crispy, and absolutely covered in cinnamon and sugar. It was delicious, and I really wished I wasn't sharing this dessert with others! 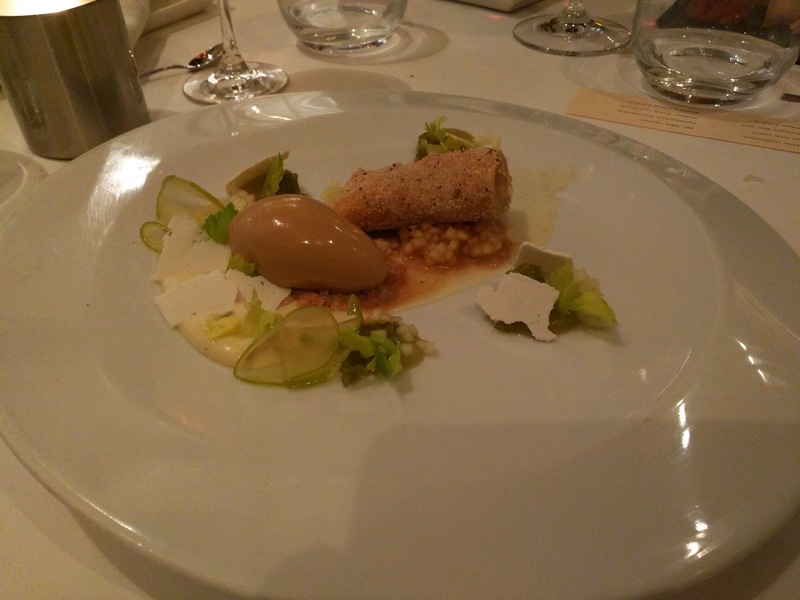 Alongside the pie was a cannelle of chicory ice cream, that melted perfectly slowly as we ate. Under both of these was a really fascinating compote with compressed apple bits and caramel, and candied celery, as well as a celery root and white chocolate ganache. Large shreds of salty ricotta and tiny sprigs of micro celery completed the stunning presentation. Apple, celery, ricotta, white chocolate, caramel, chicory ... all in one dish, and all in harmony. Sweet and salty, creamy and crispy, hot and cold ... it worked. This was one of my favorite desserts at Alexander's. We also had the cheese platter of three cheeses, including brillat savarin, and some interesting accompaniments. Pickled sliced green strawberries I could identify, but there was some sort of mustarda that I wasn't ever able to place. Perhaps it was rhubarb? The others went for the cheese, and left the apple dessert behind. I assure you, I took care of that. And after our desserts, our palate cleanser showed up. This was a bit of a timing and service falter, as it clearly should have come before the desserts. Since it arrived in the midst of the dessert devouring chaos, I didn't quite catch what it was. I think there was pickled mango involved? I didn't really like it, but one diner found it quite fascinating, and kept remarking about it the remainder of our time together. Strawberry Cotton Candy / Candies / Chocolate. 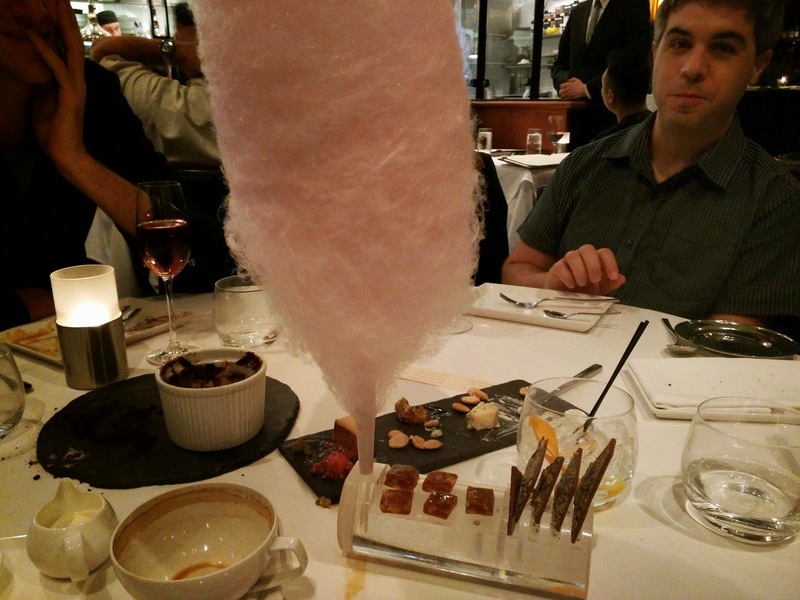 And finally, the signature end to any Alexander's meal: cotton candy, served in a special stand, with candies and chocolates. The flavor of the night was strawberry, and it was sweet fluffy cotton candy, exactly as we've come to expect. 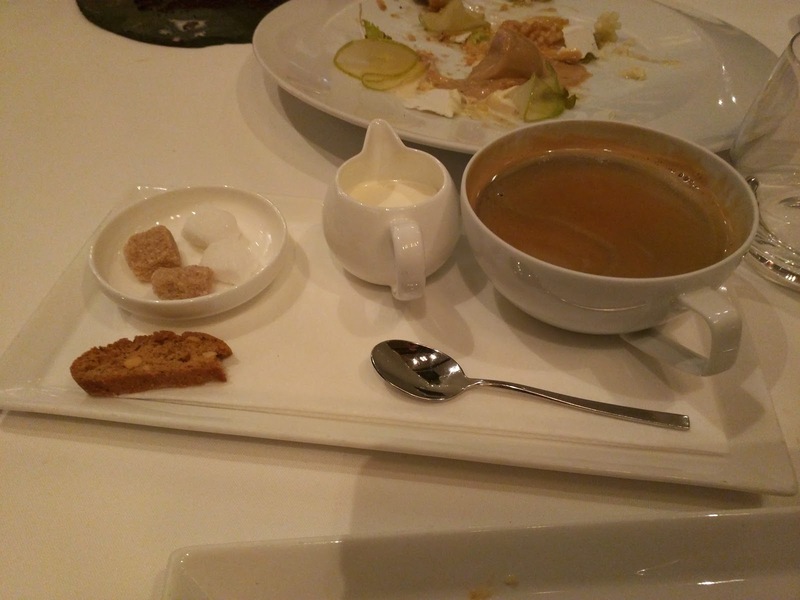 I really loved the caramel nut squares, perfect alongside my coffee, and the right ending to a delicious meal. As you know, from time to time, my group at work is unable to have our regular dinner catering for one reason or another. When such situations hit, I usually have a bit of fun finding an alternative for the group. I've tended towards seafood, generally raw, since delivery food always winds up lukewarm, and who wants lukewarm fish? We've had some successes, like high end sushi delivery from Roka Akor, and some mediocre sushi delivery from Pacific Catch, and of course, the famous takeout from Swan Oyster Depot. I've also grabbed cold appetizers and desserts togo from nearby Zare at Fly Trap several times, and that has been a bit hit. When really lazy, I've opted to just order from Munchery. But of course, I need to appeal to the group, and sometimes, the masses just want pizza. So, pizza it was. 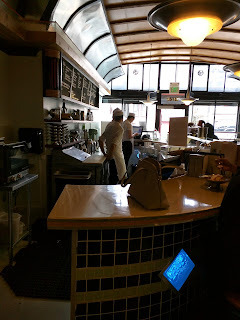 When I think of pizza in San Francisco, the only place that really stands out is Little Star. Besides Pizzeria Uno, it was the first deep dish I ever really had (sorry Mom, Schwan's frozen pizza doesn't count!). Over the years, I've visited the multiple restaurants many times. I used to love it. I'd bring every visitor there. Somehow though, I just stopped liking it. But when I mentioned Little Star as an option to the group, everyone got very excited (ok, all but one person). Everyone (except that one person), just loves Little Star. So, I figured it was worth giving it another try, it had been at least a year since I last had Little Star, and maybe I just wasn't in the mood last time? I'm a broken record when it comes to Little Star. As you can read in my previous reviews, I always get the same two pizzas: the Classic and the Little Star. Which one I prefer tends to change on every visit, or even throughout the visit. I obviously picked these two pizzas again, although this time I mixed it up and added in another pizza, thin crust no less! I've never tried the thin crust before, because, why? Last time I used Caviar to get the delivery, and the service was good enough, but this time I tried Door Dash, just as an experiment in something new. They have a slightly lower delivery free ($6.99), but do not provide some of the nice aspects like GPS tracking. They also didn't seem to use a pizza bag, or anything, to keep the pizza hot. While my delivery from Caviar wasn't piping hot, it was clear they attempted to keep my food warm; the same cannot be said of Door Dash. I am unlikely to use it again for hot food delivery. Anyway, spoiler, just like the delivery Little Star from a year ago, and my meal at the restaurant a year before that, I again just didn't like the pizza. Ojan still liked it, but, I really don't think I'll be ordering Little Star again anytime soon. 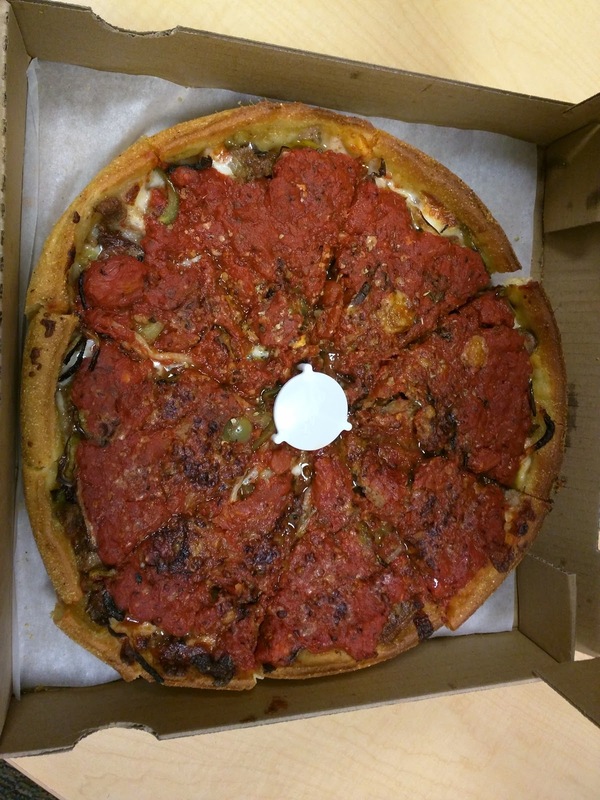 Classic, Deep Dish, Large. $29.45. "Sausage, mushrooms, onions, and green bells". I started with the Classic. Like I've said, sometimes I prefer the Classic, sometimes I prefer the Little Star. Last time this one came out on top. This time it didn't. Just like last time, I found the balance of the pizza just all off. There was way too much sauce on top. The sauce was both too tangy and too sweet all at once. It overwhelmed everything. I scraped most of it off, and then used it with my crusts. I like the crusts, and I always want something to dip them in, so the extra sauce I remove isn't *really* a problem, and I just repurpose it. The cheese was my real problem. There was just way, way too much. I thought this last time, and the time before that. I kinda just don't like generic mozzarella, and that is all I could taste. If I ever do get Little Star again, perhaps I just need to request light cheese? The toppings were generously applied, lots of everything. The sausage was in slices, and I thought I always loved their sausage, but I really, really didn't like it this time. And it isn't that I don't like sausage, I do. Something about this just didn't appeal. And ... the pizza was cold, although that isn't Little Star's fault. The crust was really soggy, again, that is just a failing of delivery. I did still kinda like the hearty cornmeal crust at least, although, it did seem a bit too oily and heavy. For nearly $30 for a pizza though, this was sad, and I honestly didn't enjoy it at all. 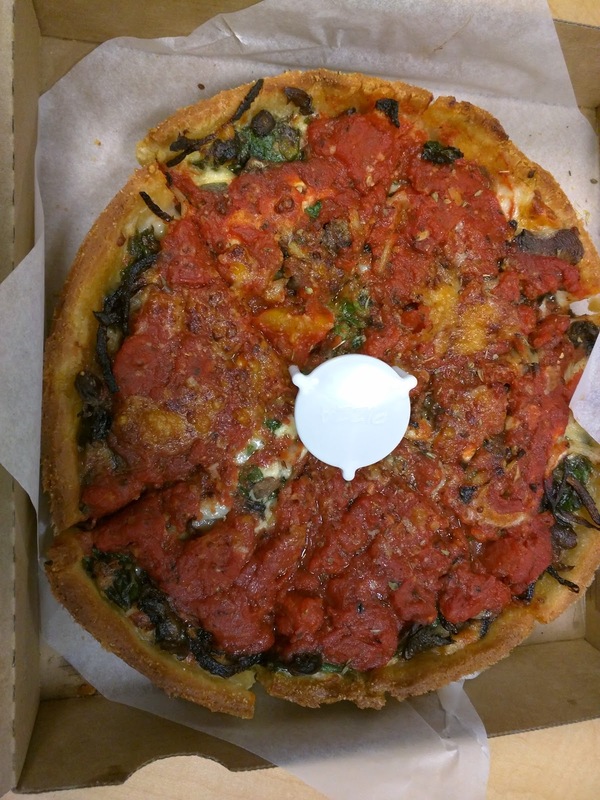 Little Star, Deep Dish, Small. $21.50. "Spinach blended with ricotta and feta, mushrooms, onions, and garlic". Next up, the Little Star, always our vegetarian pick. I had the exact same complaints about the soggy and oily crust, the excessive amount of cheese, and the overwhelming sauce. I did at least like the spinach and ricotta blend more than the toppings on The Classic, but, overall, I still wasn't happy. 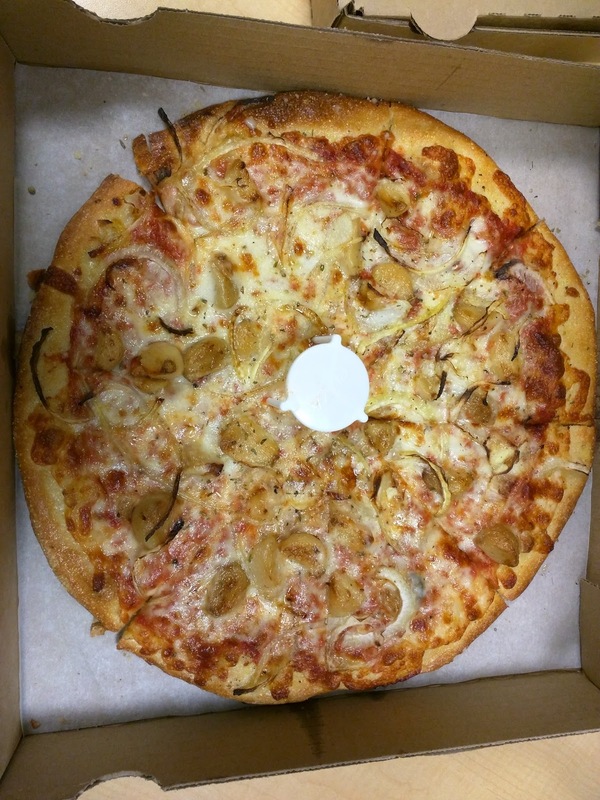 Cheese + Onions + Roasted Garlic, Thin Crust, Small. $19.85. I've never had a thin crust pizza from Little Star before. Yes, seriously. I've been to the restaurant a slew of times, always with large groups of people, and no one has ever suggested it. I've ordered delivery for groups, and no one has requested it. We all know that Little Star is all about the deep dish. So, why did I bother with a thin crust this time around? Well, partially I knew that I had kinda fallen out of love with Little Star. I thought that perhaps the thin crust would be more my speed these days? At least it would give me something different to try. I also had slightly ulterior motives: I knew if there were leftovers, I wanted to waffle them. I'm obsessed with waffling pizza (you'll hear more about this soon). At this point, I prefer to waffle leftover pizza than even to eat hot and fresh pizza. But I didn't think deep dish would waffle well. Hence, the thin crust. None of the pre-designed thin crust pizzas called out to me. Chicken. Pesto. White sauce. All meh. So I created my own, with onions and roasted garlic. I have no idea why, I've never put those two things on a pizza together before. But both are delicious, so ... why not? The thin crust retained heat even worse than the deep dish. It wasn't even lukewarm. The crust seemed even soggier. It wasn't thin style like a fancy pizza place, it really was like a piece of pizza you could get in any town, anywhere in America. I missed the cornmeal aspect of the deep dish. On the plus side, the ratio of sauce and cheese was more of what I wanted; no piles of sweet sauce overwhelming everything else, not totally drowning in cheese. I liked the onions. I thought I'd love the roasted garlic, whole cloves applied in generous quantity all over the pizza, as I certainly love eating whole cloves of roasted garlic (and, in fact, when I go to Little Star in person, we always get the roasted garlic and bread as an appetizer, and I sit there sucking all the cloves of garlic out of the bulb, long after others have given up). But ... it didn't do it for me here. I was glad to try a thin crust, to satisfy my curiosity, but, it really wasn't exciting. Of course, I did have leftovers, and I did waffle them. And ... it was magic. The transformation was everything I wanted it to be. I genuinely enjoyed my pizza this way. Stay tuned for a review of that! 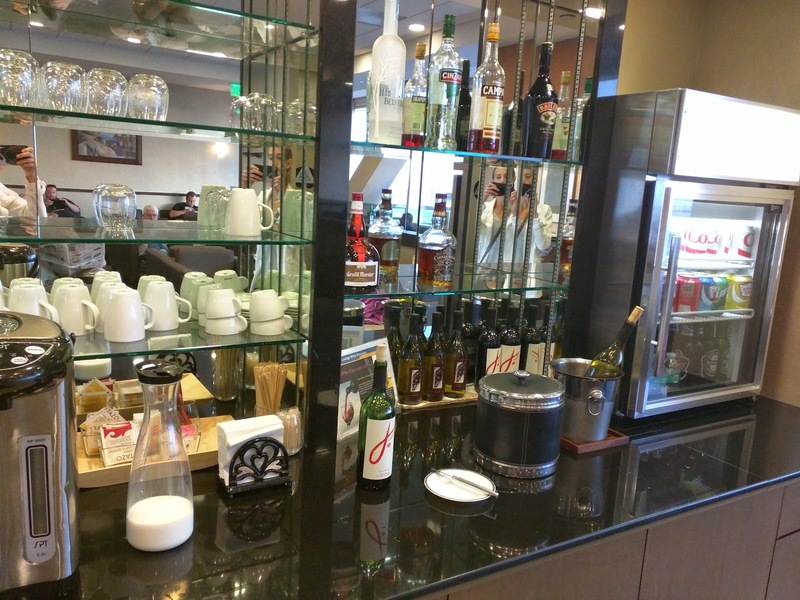 To begin my most recent journey to Sydney, my first stop was the Singapore Airlines Silver Kris Lounge at SFO. I was flying aboard Air New Zealand, but they do not have their own lounge, and us thus share the Singapore lounge. The lounge is very small, with limited offerings, but, sadly, that is pretty normal for SFO. 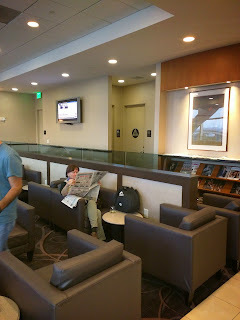 We don't really have any flagship lounges here, as I noted in my review of all the different OneWorld lounges. Since the space is small, and serves so many airlines, they have strict entry requirements. 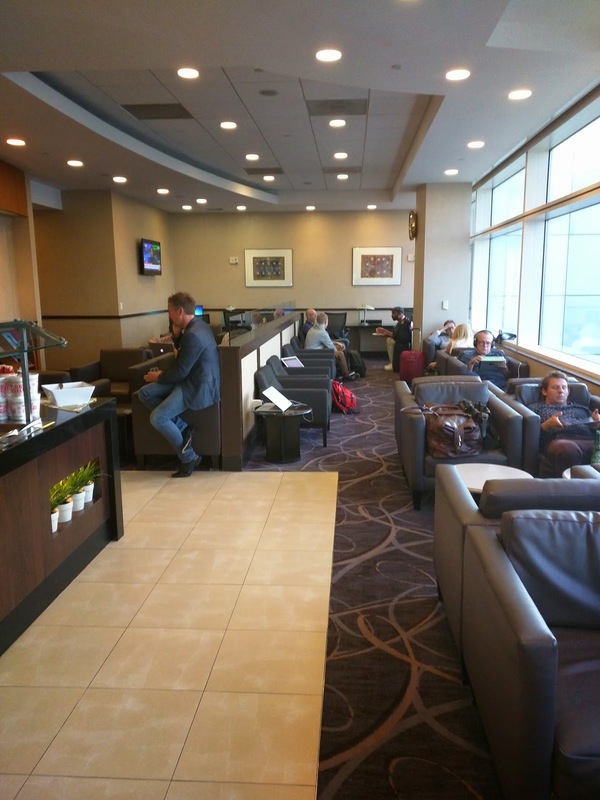 The entire time I was inside the lounge, all I could hear was the front desk attendant, saying over and over, "from the hours of 6pm to 9:45pm, the lounge is reserved for Air New Zealand passengers". People's reactions to this news was fun to observe; some were polite and said they'd come back, others were adamant that they had United status, and blah blah blah, they should be let in. The main area is made up of brown soft armchairs, mostly in pairs. They look perhaps comfortable, but looks can be deceiving. Soft, yes, but plastic-y, strangely deep, and with arms that were too high to reach over. I put my food and drink on the provided side table, and had to awkwardly reach up and over to get to my items. I was eager to get out of the chair, and actually imagined the seat on the plane would be more comfortable (indeed, it was). Besides the one main area, there are a few more tables on the side, and a trio of bathrooms, all individual and unisex. No showers. The drink area is ... limited. Yes, there are hot beverages, cold beverages, and alcohol, but within each category, your options are few. For warm drinks, there is an automatic Nespresso machine with a decent selection of 6 pod types (yes, 1 decaf), plus a hot water heater on the side with Taster's Choice instant coffee (because someone prefers that?) and two varieties of tea bags. 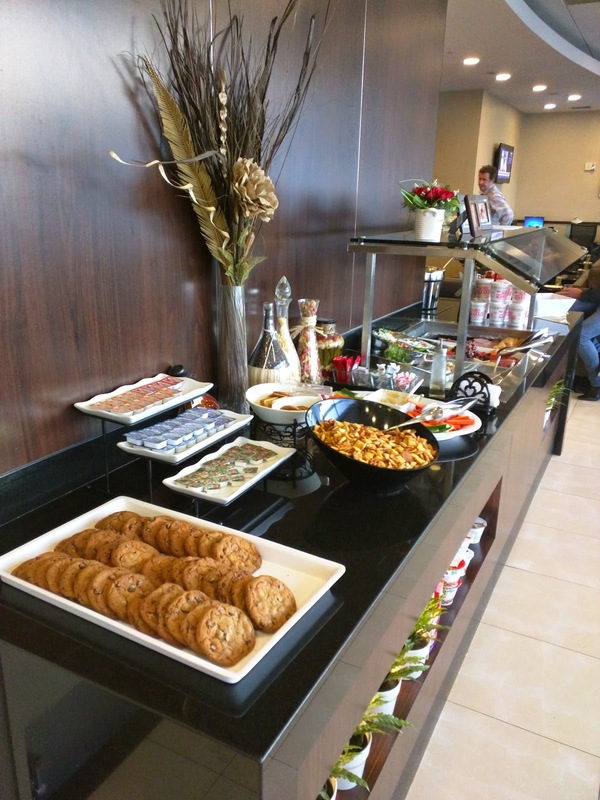 The cold beverage selection is basic soft drinks (Coke, Diet Coke, 7 Up, Diet 7 Up, Ginger Ale, and Tonic), juices (pineapple or tomato), and beer (Heineken or Tiger). Only still water, no sparkling. 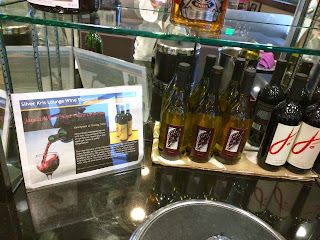 The wines on offer were a single red and a single white, from Jossda, in Napa. I tried the red and it was highly unremarkable. Not bad, not good, a decent table wine. 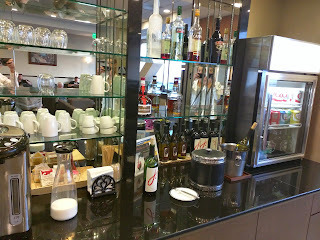 The bar was stark with only 6 items: vodka, gin, campari, Bailey's, Grand Marnier, and scotch. Ok, moving on to what I always care about, food! Food is arranged in one buffet. Plates are strangely at the other end. It seemed like we must have entered from the wrong side, since it ended with cookies and began with plates, except, it was totally awkward to get to the other side, and the flow really didn't start there. The only sweet item was chocolate chip cookies. 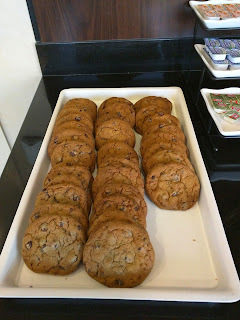 I don't really like cookies, and I already had full dinner and dessert before arriving, but Ojan took a cookie, so I of course tried it. It was everything I hate in a cookie: hard, crispy, not buttery, just not good. Sadness. Next were platters of generic packaged jam and butter. I have no idea why. Do people put jam and butter on their cookies, ever? I am guessing they were left out from breakfast? Next to the jam and butter were snacks. The jam and butter didn't go with these items either. Basic Chex mix in a big bowl, crackers, vegetables and hummus. I went for the Chex mix, mostly because I love my mom's Chex mix, but this was just the standard stuff, and I never actually care for it. 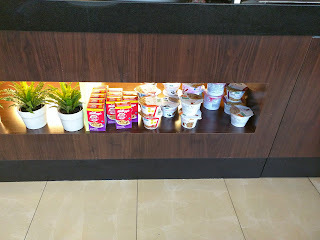 Down below were some cereals, including Kellogg's granola and a bunch of Kashi cereals. Since there was no milk anywhere I'm sure this is just where they stock them from breakfast hours, but, it was a decent selection of Kashi, and I do love Kellogg's granola. 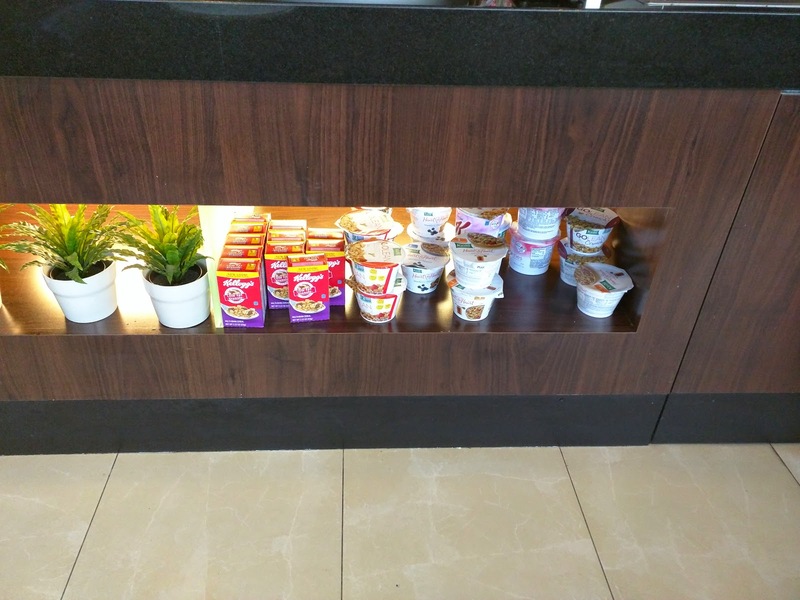 I probably would have been happy enough with their breakfast lineup. Moving along was a Caesar salad station, with romaine lettuce, dressing, parmesan, and croutons, so you could mix your own. Kinda nice to do it this way rather than pre-mixed, so those who are gluten-free can avoid croutons or vegans the cheese, and the dressed lettuce doesn't get soggy. There was also an asian noodle salad that I think had chicken, along with a dressing for it. Nothing was labelled. I quickly kept on walking, as the next platter was fruit, including watermelon, and I'm deathly allergic. I glanced at the cold cuts, but they were adjacent to the watermelon, so I most certainly didn't give them another thought. 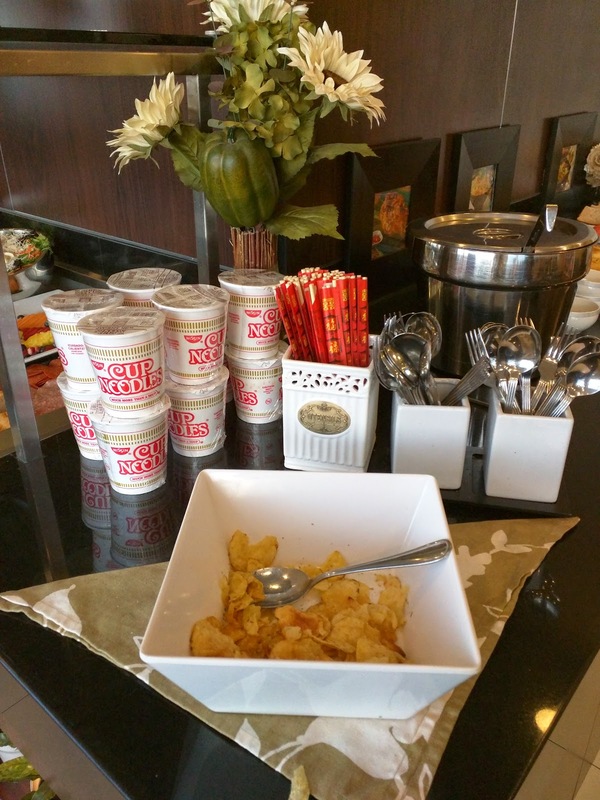 I was amused by the next offering: cup of noodles! Presumably you could get hot water from the drink station to prepare your noodles. There was another soup as well, in a big soup bowl, but without a heat source. Why wasn't it in a hot well of some sort? I guess they had no way to keep anything hot. It too was unlabeled, but I tried it. It was a thick, rich chowder. It had little bits of fatty bacon and celery. I'm not sure what else was in there, I didn't find much. It was warmer than I expected given that nothing was keeping it hot, and it was decently seasoned. I actually enjoyed my little bowl of soup. The chips were just plain, salty chips. One on a decent looking bread, one on regular sliced bread, one wrap. None were labelled. I didn't try any. A few years ago, I visited Crustacean restaurant for dinner. Crustacean is one of the An family of restaurants in San Francisco (they also own Thanh Long in SF, another Crustacean in Beverly Hills, Tiato in Santa Monica, and Anqi Bistro in Costa Mesa), and a food truck, dubbed An the Go. 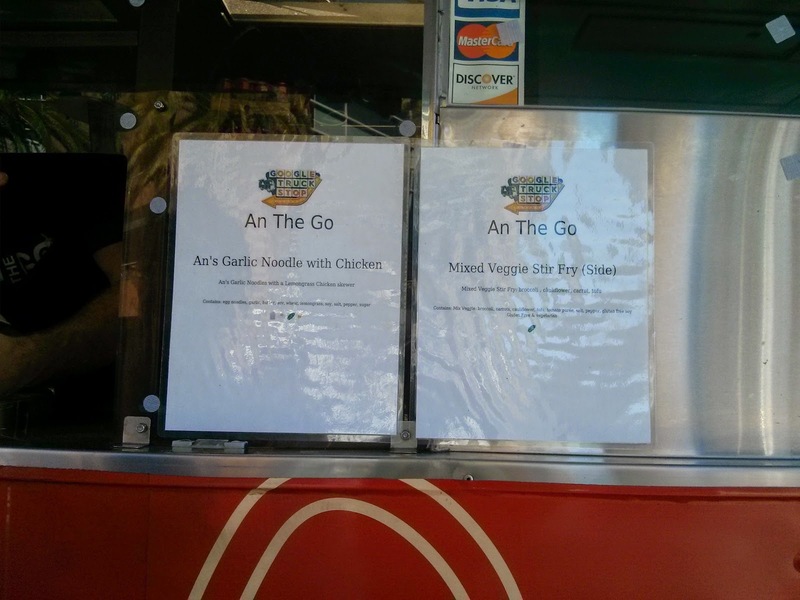 The An family is famous for one thing in particular: "An's Garlic Noodles". We had them at Crustacean when I visited of course, and I liked the garlicky flavor. I'll leave you to read more about the restaurant's claim to fame in my previous review. I'm not normally a big fan of food trucks, but as you've been reading the past few weeks, my company has been supplementing some of our dining options with food trucks, so I've been trying them out. 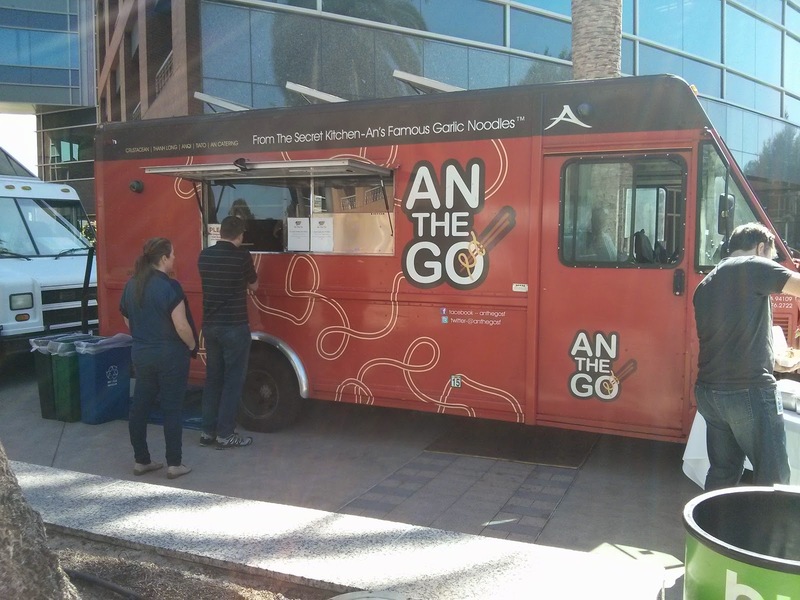 When I spotted the An the Go truck, I was actually excited, and thought there might be hope at this particular truck. I was quite hopeful that they would be serving their signature dish. I was in luck! Service was fast and efficient, inside the truck was grill that was in constant action, and my food was handed over within a minute or two of my ordering, unlike many of the other, slower trucks I tried. The menu was simple: An's Garlic Noodles, Lemongrass Chicken Skewers, and Mixed Veggie Stir Fry. I mostly just wanted the garlic noodles, but decided to try the full meal. 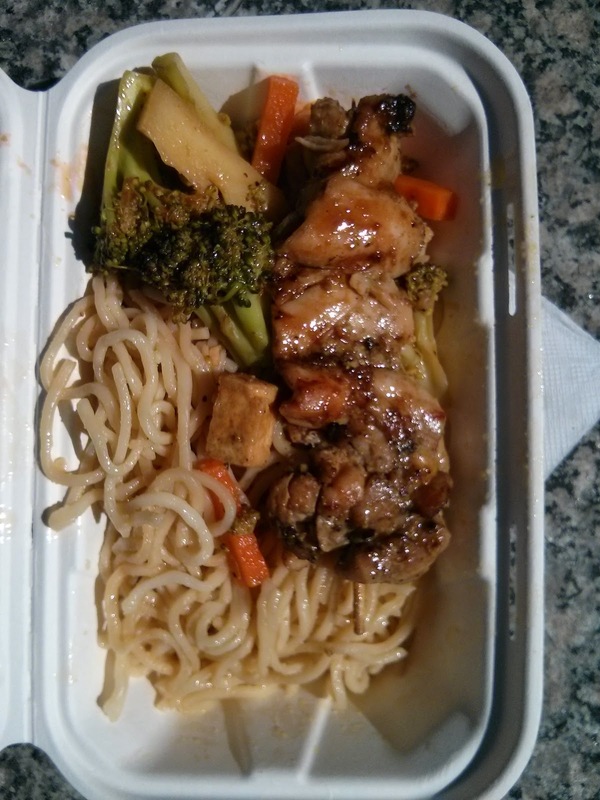 An's Garlic Noodle ($7.50), Lemongrass Chicken Skewer ($2.50, Mixed Veggie Stir Fry ($2.50). I eagerly dug into the garlic noodles. They were fairly delicious. The noodles weren't too mushy, although they were clearly not freshly prepared. They weren't as buttery as I remembered from last time, but that isn't necessarily a bad thing. The garlic flavor was remarkable. So, so good. Serious garlic. The serving of noodles was ridiculously generous, and somehow, I devoured it all. Did I mention, so good! The chicken had a good char on it, but was thigh meat, really not my style. The mixed veggie stir fry contained broccoli, cauliflower, carrot, and tofu. The veggies were decent, a bit overcooked, not super flavorful, but not bad. But, the noodles. Oh man, the noodles. So good! I'd go back again in a heartbeat. An the Go, Frozen Kuhsterd. Remember when I said I'd go back? Well, I did! 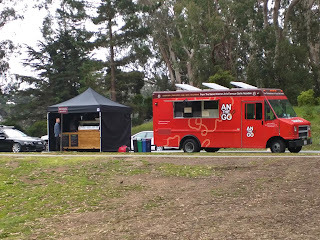 My work group had a picnic in Golden Gate Park, and we were given the choice of all the Off the Grid food trucks to cater the event. I knew the moment I saw the list where my vote was going: An the Go! I eagerly told all my co-workers about the garlic noodles and encouraged them to vote for An the Go. I may or may not have been accused of stuffing the ballot box. Regardless, An the Go won. We also picked a sweet treat, Frozen Kuhsterd, which you can read about separately. 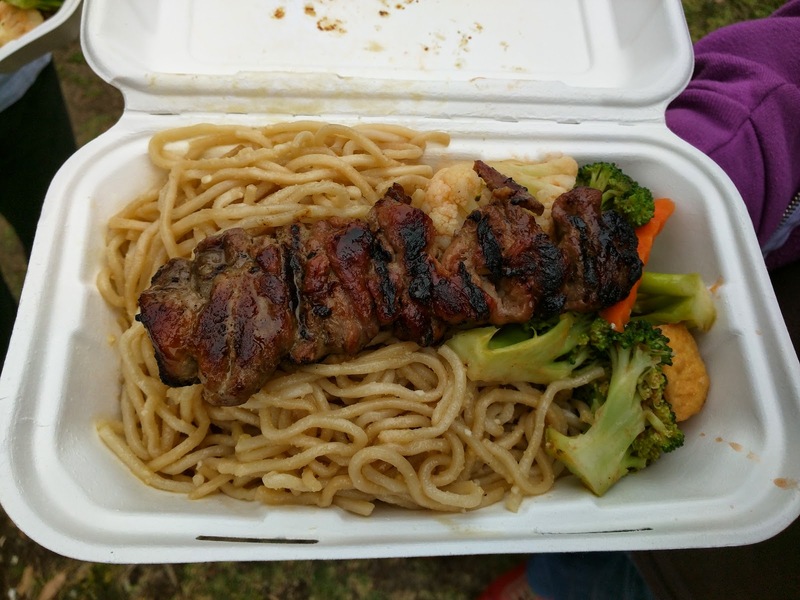 Garlic noodles with mixed vegetable stir-fry and 5-spiced pork skewer. The menu for the day was of course the garlic noodles, with veggie stir fry, and our choice of chicken or pork skewer. Since I knew how large the garlic noodles serving was, I opted to split one box with Ojan, particularly since we had a ton of other snacks, and of course the frozen custard to look forward to. I let him pick the skewer, since I wasn't really intending to eat it. He went for pork. I didn't try it. The veggie mix was the same as my previous serving, broccoli, cauliflower, carrots, and tofu. Unremarkable, perhaps a bit mushy and not particularly flavorful. The garlic noodles let me down. I guess I had really high expectations, but this time around, I just didn't taste much garlic. The garlic is supposed to be their defining characteristic! And again, like the last time I got them from the truck, they weren't buttery like at the restaurant. I tried not to let my disappointment show, since I was the one who advocated so loudly for An the Go, but, they were pretty plain and boring. I saw others asking for hot sauce to go along with the noodles, so I clearly wasn't the only one who felt this way. I saw a lot of noodles go into the trash, but then again, the servings were huge.